More instruments are being installed throughout the islands to expand the detection network for earthquakes and tsunamis, says geophysicist Gerard Fryer at the Pacific Tsunami Warning Center. And after Oct. 15's earthquakes, University of Hawaii seismologist Cecily Wolfe said she believes additional funding is needed "to have a modern, integrated seismic network and to bridge some existing gaps that are present." Wolfe, who works with colleagues at the warning center and U.S. Geological Survey, applauded their efforts to upgrade the seismic monitoring system. "It's extremely important that Hawaii obtain new and modern instrumentation for improved earthquake monitoring and also rapid estimates of earthquake locations, damage and shaking," she said. This is vital for tsunami warnings and to direct emergency responders, she said. Fryer said the new instruments will include 12 state-of-the-art seismometers that measure how fast the ground is moving, as well as strong motion devices that measure acceleration rather than speed. "We were very lucky with this earthquake," he said. "It was just the right distance from a number of seismometers run by the Hawaiian Volcano Observatory that we could get nice recordings of the earthquake without things going off scale." If it was bigger than 6.7 magnitude, or further south, he said, "We would not have figured out how big it was as quickly as we did." He said the tsunami warning center's first estimate of 6.5 magnitude for the first earthquake on Oct. 15 "was pretty darn good under the circumstances." He was on standby and ran from his trailer to the operations center as soon as he heard the alarm, he said. Geophysicist Barry Hirshorn had already figured how big the earthquake was within 2 1/2 minutes after the event, Fryer said. Within three minutes the center had informed civil defense and emergency managers there was no tsunami hazard, he said. "We could only do it because the earthquake was in the right place for the instruments." The goal with the new instruments is to decide whether there is a tsunami hazard within 90 seconds of an earthquake, Fryer said. "We're sure we can do two minutes. To get to 90 seconds will take a bit of work, but we're getting the right instruments to do it." They will be a "gold mine of data" for anyone interested in earthquakes, he said. "For any earthquake anywhere in the state, we need to figure out where it is, how big and how deep." With the strong motion seismometers, Fryer said, "You can hit them as hard as you like, and they don't go off scale. If one was right on top of an earthquake, you can use it to figure out how big the earthquake is." A tsunami could occur with a shallow earthquake, depending how big it is, he said. "We have to figure these things out fast." Sunday's big quakes remain a puzzle to scientists. They seem to be associated with flexure of the lithosphere, a relatively rigid layer of the earth's mantle beneath the islands. "The reason there is a bit of puzzle is we have the occasional big earthquake ... but we don't have a lot of little earthquakes of that kind," he said. "The statistics are very odd." Wolfe said there were two separate earthquakes on separate faults. The first one, measured at 6.7 magnitude, was 18 to 24 miles deep, she said. It triggered the second, 6.0-magnitude earthquake about 12 miles deep on a different fault zone, she said. The earthquakes occurred in the earth's mantle because of stresses associated with the load of the volcanoes and flexure of the lithosphere, which acts like a beam, she said. "It bends and depresses with a heavy load." The Big Island is a huge feature, higher than the Himalayas, she said. "It creates a huge load on the underlying mantle and creates stresses that create deep earthquakes." The Hawaiian Volcano Observatory locates roughly 5,000 earthquakes each year, and about 1,000 on average are deeper than eight miles, she said. Many are in the earth's mantle, and they are mostly small earthquakes, she said. However, earthquakes with magnitude greater than 6.0 do occur at depths in the mantle, she said, noting the 1973 Honomu earthquake beneath the Hamakua Coast with 6.2 magnitude. It caused nearly $6 million in damage. 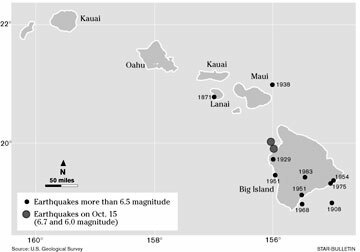 In 1871 a magnitude-6.9 earthquake at Lanai did significant damage to Maui and Molokai and gave Oahu the strongest shaking, Wolfe said, noting it damaged buildings on the old Punahou campus. Hawaii's deadliest earthquake, known as the Kau earthquake, occurred in 1868 and was believed to be magnitude 7.9, she said. It resulted in 31 landslide-related deaths and 46 deaths from a tsunami. "We believe those types of really large earthquakes occur along a detachment, or interface, between the growing volcano and pre-existing oceanic crust," she said. "The detachment fault along Hawaii's south flank is the most active seismic zone." Fryer said it was believed several deep earthquakes up the chain, one in 1938 north of Maui and the one south of Lanai in 1871, were close to magnitude 7.0, but now he suspects they were about the size of Sunday's temblor. The reason is that the chimney that fell on a historic 96-year-old Manoa house remained intact during the 1938 earthquake, he said. "If that didn't shake it down -- and it was a lot closer to Honolulu -- it would mean that earthquake was not as big as we thought it was." Wolfe noted, however, that shaking varies with the direction or radiation pattern of an earthquake. Although the first seismic monitoring instruments began in about 1910, high-quality seismic recordings did not come until about 1960, providing more accurate locations and depths, possible mechanisms and magnitudes, she said. Fryer said they hope to install the new broadband seismometers within 18 months. The National Oceanic and Atmospheric Administration, which operates the Tsunami Warning Center at Ewa Beach, is paying for them, but they will be operated in collaboration with the U.S. Geological Survey. The data will be archived by the Incorporated Research Institutes for Seismology, which runs the global seismographic network, and will be available worldwide. The new instruments will be located in fairly remote places, mostly on state or federal land, about a mile from the coastline, Fryer said. "If we can put them in bunkers or caves, fine, but in many instances we will have to excavate a hole and pour concrete, to make a seismic vault. ... Putting these things in is an art as much as science." Data will be transmitted automatically to the warning center and around the world in real time, Fryer said. Each device will have two independent communication pathways so if something happens to one, data still will flow, he said. 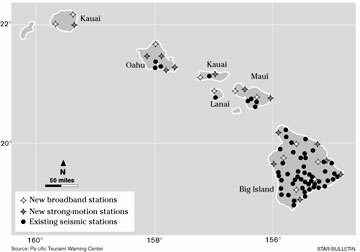 There is already a Global Seismic Network instrument at Pohakuloa and two on Oahu, one at Kipapa and one at the warning center, Fryer said. The center is installing "newer, bigger and better computers" and has requested a wider communication band to handle the deluge of data not only from the seismic instruments in Hawaii, but from outside, he said. "We pick up all global seismic data now." The center also plans to import data from the International Monitoring System, another worldwide seismographic network, run by the Comprehensive Test Ban Treaty Organization, he said. "We're excited," Fryer added. "We performed well on Sunday, but we did so almost by accident. Our intent is always to perform well and do so by design."